Despite the best efforts of the gamekeeping fraternity, this does appear to have been a good year for mountain hares. I have seen a lot of hares this year. However, the population is cyclical and we are probably simply seeing a positive part of the cycle. The data shown previously reveals declines too severe to be part of a natural cycle. In the last issue, I wrote about the SLE voluntary restraint on large scale culling. 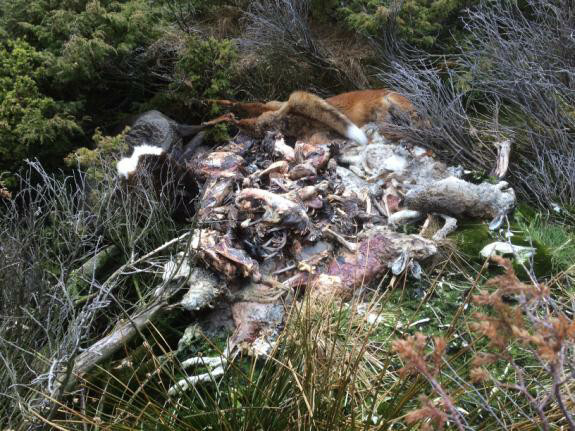 The photograph shows a group of gamekeepers about to start culling mountain hares. Presumably, their employers have told them about the voluntary restraint? For an interesting article on this incident in The Herald. Rob Edwards wrote a follow up piece. The long-awaited Review of Sustainable Moorland Management by the Scientific Advisory Committee of Scottish Natural Heritage finally arrived in October 2015. It proved to be very disappointing. It put forward ten recommendations as listed below. SNH is asked to update its audit of changes and trends in moorland biodiversity and the influence of land use drivers, and to ensure that biodiversity objectives/outcomes are central to interventions to improve and demonstrate sustainable moorland management. SNH is asked to strengthen its geodiversity portfolio in support of its delivery of the 2020 Challenge for Scotland's Biodiversity. In consultation with other key stakeholders, SNH is asked to define and communicate its understanding of ecosystem health in relation to moorland, and the adoption of high standards for management practices. SNH is asked to ensure that by 2019 the habitat map for Scotland, based on Annex 1 habitat types and the EUNIS habitat classification, is completed. SNH is asked to work with the Scottish government to develop the evidence base on the impact of SRDP spend on biodiversity (notably the relationship between agricultural grazing and High Nature Value outcomes). Scotland's Moorland Forum, working with its members and wider stakeholders, is asked to produce a shared vision for Scotland's moorlands founded on environmental sustainability, and to devise a strategy for delivering this. The Scottish Government, as it develops national and regional objectives within its Land Use Strategy, is asked to give further consideration to strategic planning and the regulatory framework underpinning moorlands, with due regard given to environmental, social and economic outcomes. SNH is asked to work with Scotland's Moorland Forum to design and deliver large-scale and long-term experiments to support our understanding of moorland ecosystem health. SNH is asked to complete its inventory of key data on the current management of moorland (e.g. Deer Management Group plans), with protocols governing availability and use by key stakeholders, and noting the need to adapt to climate change. SNH is asked to continue its leadership, on behalf of the Scottish Government, in resolving conflicts over moorland land use, conservation and management. As you can see, it is very general. On the positive side, it does represent a scientific advance. Should a problem arise with moorland management in Romania or in Uzbekistan, then instead of convening their own committees, they simply quote the Scottish report in full and save a lot of time and money. It will be equally applicable. Mountain hares are mentioned but apparently don't merit anything more than the tender care of the SLE voluntary restraint, which as we have seen above is worthless. Vigilance is urged and they advise that SNH should complete a fuller analysis of Adam Watson's and other available data, and consider further conservation management and research work on this species. Given the speed at which SNH work, I don't hold out much hope. We now plan to ask a series of parliamentary question to try and pin SNH down on what they are actually going to do about this. If you have missed earlier pieces on mountain hares and wish to read a general article on the subject, I have written a summary article in the Reforesting Scotland Journal issue 53, Spring/Summer 2016, due out end March 2016.